Dr. Ramesh G Patel, MD is a Doctor primarily located in Greenbelt, MD, with another office in Greenbelt, MD. His specialties include Internal Medicine. He speaks English. The overall average patient rating of Dr. Ramesh G Patel is Good. Dr. Ramesh G Patel has been rated by 16 patients. From those 16 patients 4 of those left a comment along with their rating. The overall rating for Dr. Ramesh G Patel is 2.8 of 5.0 stars. I've been seeing Dr. Patel for 15 years. Over the years his quality of care has gone down great, his nonchalant attitude is annoying and makes you feel likw he doesn't care. He looks more at his state of the art computer instead of having an eye to eye contact with the patient to see what's going on with them. Also he seems more interested now into the botox, weight loss practice now instead of internal medicine. I'm noticing more and more Drs. adding these ala carte items to their practices for more oney. One thing that really bothered me about Dr. Patel is that he missed the onset of pre-diabetes after repeated blood tests and screenings. I had the last blood test in early part of 2012 by Dr. Patel who qent over the results. I had another blood test 4 months later and test revealed I had full diabetes. I believe that with all my physicals and blood tests Dr. Patel should have seen a red flag in my reports. I've always followed instructionsband did nor eat before taking my tests. I thought this was a bad case of misreading or just overlooking the report. Dr. Patel is not good in my opnion, he sits at his little computer and types..he barely gives you an exam. When i first went to his new office I was surprised. Then again I wasn't he schedules a lot of stress test and they are $$$$ so now I see where he got the money for that fancy office. Bottom line i have left. The doctor he brought the practice from is greatly missed she was a DOCTOR. Worst Dr. I have seen in my life. I had undiagnosed diabetes , he did the blood work but never called me back about it.I cam to know some other way I had high gulocose levels(500) after 1 year of blood taken by this doctor. It ruined my life, had other problem as well.Also intrested to see only Gujrati patients. 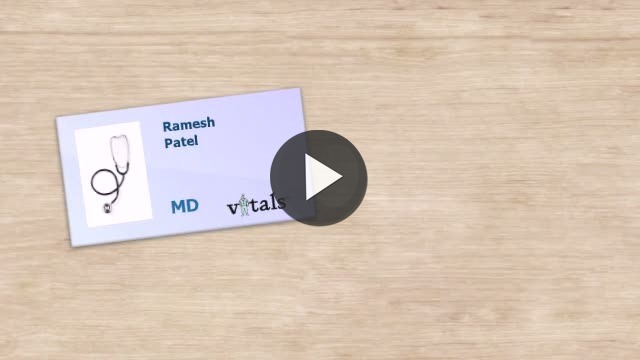 Take a minute to learn about Dr. Ramesh G Patel, MD - Internal Medicine in Greenbelt, MD, in this video. Dr. Ramesh G Patel is similar to the following 4 Doctors near Greenbelt, MD. Have you had a recent visit with Dr. Ramesh G Patel? Select a star to let us know how it was.